Efficiency of the GeV-DLSPPW platform compared with other hybrid quantum systems, a) the dependence of the simulated plasmonic decay rate was observed for the DLSPPW coupled GeV center. The inset showed the cross-section of a y-oriented dipole emitter located within the DLSPPW waveguide, b) distribution profile of the emission efficiency (β-factor) for a distribution inside the GeV center within a nanodiamond, where each colored square represented the central value of the corresponding in-plane dipole position, c) figure of merit (FOM) and transmission length of hybrid quantum plasmonic systems of GeV-DLSPPW on the Ag crystal compared with other quantum emitter plasmonic waveguide (QE PW) hybrid systems. Credit: Light Science & Applications, doi: 10.1038/s41377-018-0062-5. Quantum emitters can be integrated in monolithic nanoscale plasmonic circuitry via low-loss plasmonic configurations to confine light well below the diffraction limit. In integrated quantum plasmonics, waveguides based on surface plasmon polariton (SPP) modes that propagate electromagnetic waves along metal-dielectric or metal-air interfaces are superior to dielectric-based (and therefore diffraction-limited) photonic waveguides. The observation is in respect to the available Purcell enhancement from embedded quantum emitters and the ongoing trend toward on-chip integration and miniaturization to realize optical signal processing and integrated circuits. Different metal-dielectric configurations have been developed for strong light-matter interactions at the scale of the single photon to support the propagation of plasmonic modes confined beyond the diffraction limit. The property can enable unique prospects to design highly integrated photonic-signal processing systems, sensors and optical imaging techniques with nanoscale resolution. A variety of SPP-based structures created in the past include metal nanowires (NW), parallel NWs, V-grooves (VGs) and wedge waveguides that have demonstrated single plasmon guidance for potential quantum applications. The practical realization of such integrated quantum photonics has remained elusive due to several challenges, including high propagation losses of SPP modes and the limited control on single quantum emitters. More recently, studies have nanofabricated low-loss, dielectric-loaded SPP waveguides (DLSPPWs) structured on a silver film for simple quantum plasmonic circuits composed of embedded nanodiamonds with nitrogen-vacancy centers. 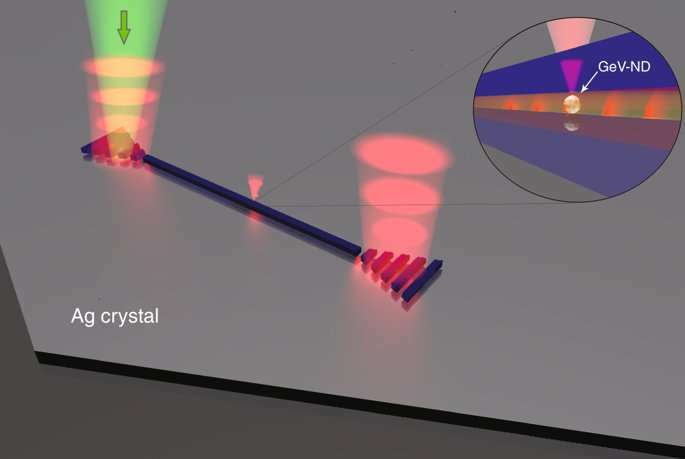 Now writing in Light Science & Applications, Hamidreza Siampour and co-workers have taken a step forward in the field of integrated quantum plasmonics by demonstrating on-chip coupling between a single photon source and plasmonic waveguide. In the approach, the physicists engineered a nanodiamond featuring a germanium vacancy (GeV) center that emits single photons, embedded inside a plasmonic waveguide composed of dielectric hydrogen silsesquioxane (HSQ) atop a layer of silver fabricated using electron-beam lithography. When a green laser light (532 nm) was coupled to one end of the waveguide via grating couplers to propagate to the nanodiamond, it excited the GeV center, which emitted a single photon that coupled into the plasmon mode of the waveguide. In the work, the researchers achieved long waveguide transmission lengths (33 µm) and efficient coupling (56 percent) to open new avenues in the development of chip-based quantum circuitry. Transmission of green laser light (532 nm) along the low-loss plasmonic waveguide, a) SEM image of a single crystalline flake (top) and fabricated DLSPP waveguide atop of the Ag plate (bottom), b) optical characterization of the waveguide for parallel (top) and perpendicular (bottom) polarizations of 532 nm laser light, c) bright-field microscopy images of the fabricated waveguides of different lengths on the Ag flake (inset shows an image of the grating couplers at the end of the waveguides used to maximize the in-coupling efficiency of DLSPPWs), d) measured propagation length of 11.8 µm for the DLSPPW on the Ag flake at 532 nm. Credit: Light Science & Applications, doi: 10.1038/s41377-018-0062-5. The study was the first to detail the synthesis and characterization of the GeV nanodiamonds. The nanodiamonds were produced using the high-pressure, high-temperature (HPHT) method; Ge was introduced during the growth process to incorporate single GeV centers. The scientists proposed and demonstrated a hybrid approach for nanofabrication using DLSPPW structured on single silver (Ag) crystals that considerably lowered SPP dampening rates, compared to Ag films fabricated by other techniques. The method facilitated sufficiently long SPP propagation at the excitation and emission wavelengths of GeV centers in nanodiamonds incorporated within a plasmonic chip. The structure of the synthetic GeV nano and microdiamonds were observed in the raw sample using scanning electron microscopy (SEM) and transmission electron microscopy (TEM). Synthetic nanodiamonds were spin coated onto Ag-coated silicon wafers and scanned with confocal fluorescence microscopy. Measured data indicated ultrabright, spectrally narrow and stable single photon sources based on single GeV centers in the nanodiamonds, suitable for highly integrated circuits. The polarization characteristics of the GeV nanodiamonds were measured using an analyzer in the detection pathway to determine the projection of single photons emitted on the surface plane. The data measured for a single GeV nanodiamond fit the model polarization characteristics of diamond color centers based on group-IV elements in the periodic table (e.g. silicon-vacancy SiV, germanium-vacancy GeV, and tin-vacancy SnV). Characterization of the nanodiamonds: a) SEM images of the GeV nano and microdiamonds of the raw sample after HPHT synthesis, the TEM image is seen inset. b) the Ge atom is located in the middle of two empty lattice sites, which includes inversion symmetry, c) the system includes an electronic structure and optical transitions similar to the group IV family of diamond color centers, d) the normalized photon rate for a single GeV nanodiamond in the Ag plane versus the analyzer angle, measured (dot) and model fit (solid). Credit: Light Science & Applications, doi: 10.1038/s41377-018-0062-5. 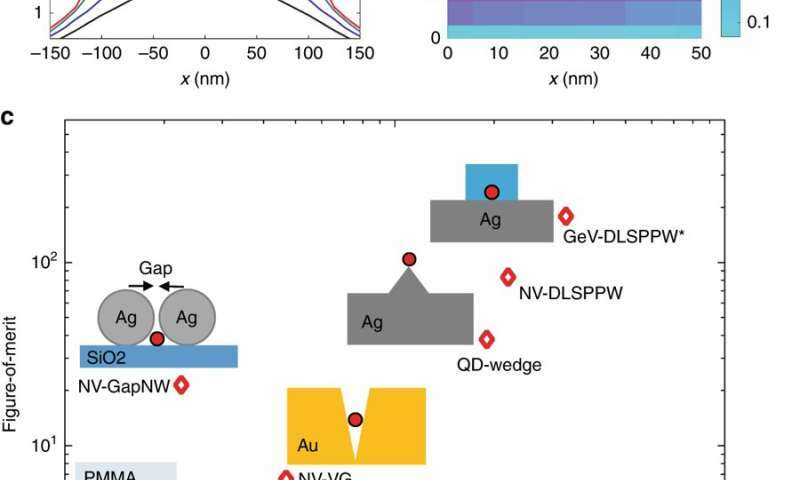 The observed capacity for single-photon emission in diamond nanocrystals can enable hybrid quantum-plasmonic systems that can facilitate remote excitation of the GeV centers incorporated in a plasmonic chip. Siampour et al. elegantly demonstrated the efficient long-range delivery of the GeV-DLSPPW system compared with other hybrid quantum plasmonic systems. An exceptional figure of merit (FOM) of 180 was revealed in the study due to a ~six-fold Purcell enhancement, 56 percent coupling efficiency and ~33 µm transmission length at a wavelength (λ) of 602 nm. Electron beam lithography was used to fabricate the waveguides with HSQ resist on Ag-coated substrates to contain the nanodiamonds featuring single GeV centers - added via controlled placement into the device. The technology provided ~30 nm precision in placement, enhanced via observations with SEM imaging, limited by the size of nanodiamonds, which could be fabricated down to 1 nm using existing diamond synthetic technology. 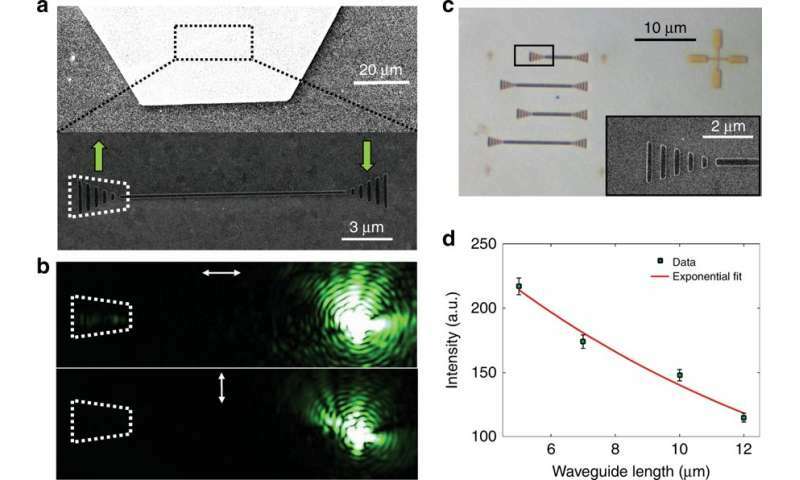 The fabricated waveguide was visualized with atomic force microscopy (AFM) and with a charge coupled device (CCD) camera after nanodiamond excitation via a green pump laser. On-chip excitation of a single GeV nanodiamond (ND) assigned via controlled placement in a device fabricated with hydrogen silsesquioxane (HSQ) atop Ag film a) the sample layout and working principle of direct excitation of a GeV nanodiamond embedded in a plasmonic waveguide, b) AFM image of the fabricated waveguide (left), CCD image of the whole structure where the nanodiamond is excited (right). The three spots ND, A and B showed excitation and emission of the GeV emitter (ND) as well as coupling of GeV to the DLSPPW mode, propagation and out-coupled radiation from the two ends (A and B). Credit: Light Science & Applications, doi: 10.1038/s41377-018-0062-5. Additionally, the authors used a single crystalline Ag flake instead of Ag film to significantly enhance the DLSPPW propagation length. Green laser light transmitting through the DLSPPW mode was optically characterized as polarization along the waveguide axis. Transmission was measured for several waveguides of varying lengths to show extraordinary propagation lengths (~11.8 µm) for the green laser light through the low-loss DLSPPW. Schematic illustration of the device layout and working principle for on-chip excitation of a nanodiamond. The nanodiamond carries spectrally narrow single GeV quantum emitters embedded in a DLSPP waveguide. Credit: Light Science & Applications, doi: 10.1038/s41377-018-0062-5. Using a similar set-up, the scientists proceeded to demonstrate and confirm remote excitation of the GeV center coupled to the DLSPPW mode. Subsequently, the GeV decay rate was simulated using the finite element modeling (FEM) method and a decay rate of up to four-fold was predicted for a GeV center in the waveguide compared to its emission in vacuum. The system demonstrated superior performance when compared with previously demonstrated systems, the observed Purcell factor can be further enhanced in future studies by using a larger refractive index dielectric such as titanium dioxide (TiO2). The study opens the way to integrate an excitation laser, quantum emitter and plasmonic circuit onto the same chip. Previous strategies have demonstrated the detection of single plasmons and two-plasmon interference on a chip. By combining all three technologies on a single chip, the authors envision that it will be possible to integrate all elements of a quantum plasmonic circuit on a chip in the near future. More information: On-chip excitation of single germanium vacancies in nanodiamonds embedded in plasmonic waveguides, www.nature.com/articles/s41377-018-0062-5 Siampour et al, 12 Sept 2018, Light Science & Applications. Plasmonics beyond the diffraction limit www.nature.com/articles/nphoton.2009.282 Gramotnev & Bozhevolnyi, 29 Jan 2010, Nature Photonics. Is it intentional that lower scales are usually cut off the main graphs? Copyright perhaps? Not sure of your premise and expectations or exactly what you are trying to do. We already know what materials may yield useful optical linear and nonlinear results, calculable. we also know better representation of plasmons and photons showing the actual superimposed moment(s) and causality. I don't mean to 'cause you discomfort, learning som'n new always tastes bad if it refutes anything you use as a basis. I get it. Relax and smile when you "get" reality! Funny ain't it? Gotta go, what ya see, and what can be seen is two different things.